The Farmers Almanac is claiming that next summer will lead to record setting heat across the world so we should prepare now for the summer months to prevent being caught unawares. Electricity can be quite expensive if you are running the air conditioning on the hottest days so how can you prevent excessive bills? There are various stages of these curtains varying in price and thickness. Personally, I bought mine from Target for about seventy dollars per set. These curtains prevent the sun’s rays from beating down into your house during the summer and prevent cold air from entering during the winter months. Keep your curtains closed during the hours of the day when the sun is directly shining into your office windows to keep your office cooler. 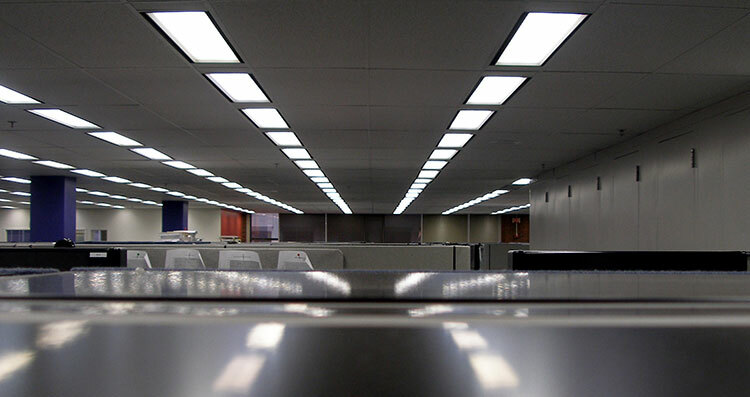 Ceiling fans installed in your office will circulate air to prevent your space from becoming stuffy and stifling hot. Most ceiling fans have an option to reverse the airflow in the winter time to help keep your office warmer, too. Electronic devices that are on and running constantly will usually generate a lot of heat, especially in the summer months when your space is already warmer than usual. So, turn the electronics off when you are not using them. Printers, desktop computers, and servers will generate the most heat so those should be looked at first. This will not decrease the temperature in your office but it will help the way you respond to the environment. Choose clothing that is light and breathes easily in light colors that reflect the sun’s light rather than absorbing it. Wear suits or dresses that are single layer and not lined because extra layers will trap your body heat. If you can, avoid wearing a tie and suit jacket because this decreases the layers that you are wearing. We learned a little fun fact recently that your body warms up in order to break down your food so if you are eating heavy meals during the day then you will be warmer than the woman that is eating a light salad in the cubicle next to yours because your body needs to metabolically break down your heavier meal for a longer period of time which results in your body becoming warmer. Drinking cold water will decrease your core temperature and will prevent headaches during the warmer months. When the weather is hot, we naturally sweat more and dehydration will cause the body to warm up exponentially. My friend uses a fan with a bowl in front of it with ice in it. The ice is cold but as it melts the air from the fan pushes it out into the air and cools the air down. This is a makeshift air conditioning unit I think. Another way that you can use ice is to wear ice packs around your wrists or place one on the back of your neck. This will, also, help cool your core temperature. “I don’t have time” is the number one reason people use to explain why they don’t keep their offices tidy. We get it, the pressure is on when it comes to meeting deadlines, finishing projects, and fitting everything into an eight hour day. But keeping your workspace clean might actually save you time, and make your job a lot less stressful when it’s easy to find everything you need and when you don’t have to worry about spilling your strategically placed, half-empty coffee cups all over every time you turn around. Here are 15 steps for cleaning up your office in 15 minutes that you can do every day. Spend a minute on each activity daily for a cleaner workspace. The soda cans, old paper coffee cups, last year’s calendar, and the thin mint wrappers have all got to go. Take a minute to grab all the garbage you spot around your office and throw them away. Loose papers are messy and easy to lose. Either file them away or recycle them if they are no longer needed. We all tend to hang onto things at work that takes up space and belong at home. Gather up all of those items you’ve been forgetting to take home with you and put them in a bag, ready to go by the door. If your desk is so covered in office toys, memorabilia, and other items that you don’t need to do your job and make it hard to move, it’s time to consider relocating some of them. You may have bought 10,000 paper clips in bulk because it was cheaper than grabbing the 100 pack, but will you be using all 10,000 anytime soon? If no, take some and give the rest to one of your coworkers. Same goes for most other office supplies. Except for pens, they’re like socks, they tend to disappear. This one is simple, dust off all your surfaces, especially keyboards. Speaking of keyboards, you’ll want to disinfect it too, because keyboards are breeding grounds for germs. No one likes a messy desktop. Create files for easy computer access and clean out your inbox every day. The snacks you’re hiding under your desk need a better place to live. Try narrowing down a number of snacks you have at work to save on space and keep healthy. If you think you have too many things on your desk, you probably do. Try to keep only what you need out on your desk. Labels are great for making sure everything has a place. If you want discreet labels, create a colored-coded legend and use stickers to the label. Label one thing each day until you’re done. If you’re using your cabinets and drawers as secret hideaways for junk and clutter, consider cleaning one out each day. There are lots of options for indoor scents, but try to pick a gentle one and make sure no one is allergic or irritated by scents in your area. Whatever is left, give it a quick wipe with a disinfectant. Make sure you haven’t forgotten to toss any garbage or file away any papers you left out. Workplace productivity is key to maintaining a successful business, no matter how big or established that business is. Productivity is all about producing something of quality in a given amount of time. Productivity is also linked to efficiency, which is all about accomplishing things in the best way possible. The productivity of a company or business relies on the productivity of the employees who work for the business. However, regardless of how hard an employee or employees may work, they won’t perform as well as they could if they are discontent. Happiness at work can increase productivity tenfold just due to a change in perspective. Humans are emotional creatures, and fair treatment while encouraging happiness is the best way to achieve the best productivity results possible. Sometimes, rigid 9 to 5 hours is not the only way to go. To minimize burnout and maximize productivity, incorporate flexible hours. There are lots of ways, both on big and small scales, that you can create a more enjoyable work atmosphere for employees. It can start with small, simple changes like encouraging them to bring in personal items to incorporate into their workspace, to adding pops of color and opting for workstations rather than individual cubicles. These are all simple changes that make a world of difference for increasing both productivity and creativity. Try encouraging that employee to take breaks can help de-stress individuals, allowing them to work at their full capacity for longer. This one is simple. Instead of holding frequent meetings, try holding one or two meetings a week. This gives employees time to prepare better and be more productive. Clattering keyboards and idle chatter can be very distracting for some individuals. In fact, noisy locations can even put people on edge by engaging the fight or flight response in their brains, which can lead to burnout due to the nature of the adrenal hormone. Help fight the noise by providing soundproofing headphones as a simple alternative. Encouraging a balance of personal life and work life is key to productivity and happiness in the workplace. Think twice before sending too many emails when an employee is out of the office unless it’s urgent. Communication is one of the greatest problem solvers there is. Encourage open communications between everyone on your team by providing places to meet and discuss things besides the break room or meeting rooms. Personal meetings and group dinners can go a long way with getting to know your employees. It can also help you both establish trust and a better relationship, allowing you to work together in a better way. This one is easy. Don’t keep the office too cold because it can decrease productivity due to discomfort. Keep the temperature optimal depending on the weather outside. Optimal temperature usually lies between 70 and 75 degrees Fahrenheit. Don’t be afraid to ask your employees what they think would help them to be more productive. They probably have some great ideas that you may have never thought of. Spring cleaning isn’t just for spring. It’s always a good idea to do a deep clean of your office at least once a month. By doing a deep clean of your office once a month, it can help you to keep on top of daily cleaning activities, allowing you to do a little bit of tidying every day, instead of constantly scrambling to dig yourself out from underneath a mountain of clutter. There are many great strategies for office spring cleaning, but below are our top 7 tips and tricks for a thorough office cleaning. Before you begin, go ahead and identify which places in your office are the most cluttered or messy. Take note of those areas in order to come up with a system or a solution in order to better maintain those areas in the future. You should make a clear distinction between the different parts of your office and which activity should happen where. For example, the desk should be for general work, the closet for storage, shelving for materials etc. Label things. It will save you time and energy in the long run, especially when you need something specific in a timely manner. To label, you can use a labeler, color coded stickers, or almost anything else to categorize papers, supplies, and more. When you’re doing a true deep clean, the ‘clean’ part is important. Use disinfectant wipes or spray on everything, especially computer keyboards, screens, door and drawer handles, and any other surface you can clean off. For high shelves, take care to use a step stool or ladder instead of a chair for safety. Small storage boxes can make a great alternative to filing cabinets. They an inexpensive, light, and easily stackable. Just make sure not to stack them too high or too heavy so that they become a hazard. Certain legal documents are required to be kept on file for a specified number of years. After that, you are free to do with them whatever suits your fancy. We advise shredding them. Check how long you need to hang on to important documents before you can part ways with them, and label them with corresponding expiry dates. Get a piece of paper and jot down things that you can’t live without having in your office. If you’re sitting there stumped after ten or twelve things, those are probably the most important things you need to do your job. Everything else is secondary. If it doesn’t make the list, reconsider whether or not you need it in your office. Of course, you don’t need to strip your office down to the absolute bare minimums, but reducing what you keep on hand can make working a lot tidier and easier. In a small office, space is everything. There’s a lot of things you might need to keep on hand to help you be successful and productive, but with limited storage space, this can be tricky. Well, there are lots of tricks and tips you can use to help maximize any space, no matter the size by looking at DIY storage and organization methods that will save you space and money. Even if you don’t consider yourself a “crafty” person, these DIY storage and organization tips can definitely work for you too! Muffin tins make great organizers for inside drawers, on shelves, and almost anywhere. They are space-savers, and help you to keep the odds and ends tucked away so you don’t lose track of anything important. On the subject of kitchen staples for use in the office, kitchen wire racks make great, lightweight, portable shelving option that you can tuck away and move around. Don’t knock it till you try it. This one is expected, but instead of losing track of import documents, post them to the magnet board instead. You can also display meeting times, important notes, pictures, or anything else you’d like to put up on the wall. On shelves, you can use collapsible fabric storage baskets to help you maximize storage space. Mason jars seem to be the DIY staple these days, but they really are great for multi-purpose use. You can use them individually or you can hot glue them together for compartmental storage. Repurposed wooden magazine holders by attaching them to the underside of a shelf, providing extra storage space for papers and files. Washi tape comes in handy for those of us who can’t tell our cords and cables apart from each other. Wrapping some washi tape around each cord and labeling it accordingly with a permanent marker can save you time and a headache. Binder clips are even more useful when they keep your wires and cords separate from each other. Attach the binder clips to the edge of your desk, then pull a cord through each clip that you want to keep separate. Since we’re all about organizing our tech, you can attach a small hook to the underside of your desk and hook chords, cables, and wires or it to support them, keeping them off the ground and providing you with more space. This one is great for anyone who likes to stay environmentally conscious. Reuse wooden crates as individual shelving units and stack them however you wish. You can rearrange them freely, or you can attach them together with extra strength wood glue. Peg boards will keep things like tape and scissors off your desk for good. Just attach the board up on the wall and hang lighter items on them with ease. You can never go wrong with a few good binders. They can keep your papers and notes organized and they stack easily. How messy is your desk right now? Be honest. At work, we tend to be bogged down by every little thing we have to get done, that we feel we don’t have time to eat lunch away from our desks, have a break, or keep our office space clean. But, what if I told you that keeping a cleaner workspace would actually save you more time than you spend cleaning it up? It’s true. You can easily keep much more productive in a clean and organized space over a messy one. Not to mention that cleaner means fewer germs, which also means staying healthier and putting your sick days to better use. There are lots of strategies you can use to help keep your office both clean and healthy. Every little bit helps, keeping in mind that cleaner = more productive. Do you really need three tissue boxes on your desk? Or how about all of those secret Santa office gifts that you never use and just sit there getting in your way? You probably don’t need a lot of what lies around your desk and office space. You can accumulate a lot of junk in the office over time, and it may be time to do some spring cleaning at the office. You can take it home, store it away, or when in doubt, throw it out. You know all those second and third copies of documents you don’t really need on hand? The ones that are stacked up on top, under, and around your desk? If you do, you may want to start scanning those papers to digitally store them, that way you can get rid of the physical documents, but still keep the information readily available if you ever need them. It’s not just about keeping things tidy, you have to keep things clean too. Things like disinfectant wipes and screen cleaner should be staples in your office. Not only will you have a cleaner work environment, but you’ll be healthier too. Keeping your electronics clean is also important when fighting the spread of bacteria, especially during flu and cold season. There are so many options for desk organizers that save you space and keep your space clean. From tuck-away under-the-desk drawers to plain old file cabinets, there are endless options for devices that will help you manage your space. You can even label drawers and containers to better aid in ensuring everything has a place and returns to it after use. One and done is not how is works when it comes to cleaning. You can’t clean your workspace once and expect it to stay clean. You have to clean as you go. Don’t let trash and stacks of papers or files pile up, throw away trash and sort documents as you receive them instead. Also, it’s very helpful to designate one day a week to clean up, in case you fall behind and need to catch up. Zero Waste Lifestyle Around The Office – is it possible? Garbage is everywhere. When going to the store, it is easy to see the amount of unnecessary packaging on products, and the unnecessary ingredients in them as well. Is it possible to make the office a place of no waste? In an office setting, there are many employees to obtain products for. The necessity for large quantities allows for businesses to purchase in bulk. Even something as simple as coffee for the break room can be purchased in bulk. The wonderful thing about bulk purchases is the fact that less packaging is necessary. Companies often do bulk orders without added, unnecessary packing in order to save money and make the bulk costs lower, and more affordable, than purchasing in smaller quantities. When picking up supplies for the office, reuse containers for transport. Do not waste unnecessary boxes or bags, as they will merely create waste for the office space. Having a supply of reusable containers and bags is key to a zero waste environment. When it comes to office paper, there are compostable options available. If there is no necessity to toss paper every time there is a printing error, there is less waste. For bathroom soaps and detergents necessary for cleaning purposes and hygiene, it is simple to learn how to make these products. This cannot only be zero waste, but it can also save a great deal of money for the business. This also may encourage employees to try similar ideas in their own home as they become acquainted to handmade products in the office. Encourage employees to bring containers from home for lunch. Rather than having prepackaged food boxes filling the trash, employees can bring home cooked meals in reusable containers that can go back home with them after use. Provide employees with reusable water bottles! If employees do not need to bring in plastic bottles and constantly throw them away, they will be able to refill throughout the day, and also represent your company. This not only is good for the environment, but also is also visually pleasing to customers, and looks far more professional than plastic. Encourage refilling pens and pencils. Rather than tossing a pen every time the ink runs dry, allow employees the option to refill – or collect the pens to be refilled for them, and replace them with ones that have already been refilled. The same goes for ink cartridges! Doing this also generally involves discounted ink as well – again, saving the business money. Creating a zero waste office experience is entirely possible and the best direction to head in for the modern world. Choices like this let the earth be thankful, while also allowing businesses to be thankful for the amount of money being saved! Renting is expensive. When it comes time to move out of an apartment or home, the hope is always to get back that expensive security deposit. However, often times the landlord is left with a hefty cleaning workload in order to make the unit ready to be rented once again. Whenever this happens, it’s goodbye security deposit! So what are the most important places to clean that often get forgotten? It is extremely simple to forget about cleaning behind and under appliances. No matter how thorough a home cleaning, going beneath and behind extremely heavy appliances often feels unnecessary. Over time, these locations build up, and become progressively less clean. These are appliances we use every day, but seldom need to move around (thank goodness for that!). Despite this fact, dust and food build up and get lost for months, even years. Often times, landlords will find unpleasant surprises from crumbs and dust developing behind the stove. Just as with the stove, crumbs and dust develop behind and underneath the refrigerator. Take the time to pull out the fridge and vacuum up messes left behind. Landlords do not want take the time to clean up these messes, and may need to hire someone to take care of what was left behind. By taking a few minutes to clean up, the security deposit is likely not to be kept. Most people don’t think to clean out the light fixtures unless a light bulb is being changed. In some rentals, light fixtures are never even touched by the tenant, as maintenance often handles light bulb changes. Once tenants are moved out, finding dust build up and dead flies is extremely unpleasant to property owners. With this as well, it can be easy to forget to clean off ceiling fans if they are not in use. Make sure to wipe away that developing layer of dust. After living somewhere for a while, plenty of pictures get hung up, brackets for the TV get hung up, and shelves get hung up – it’s what makes a home look like home. Once everything comes down, the walls are full of holes! Landlords end up needing to patch and paint, wasting a lot of their time and money. Because of this, your security deposit becomes the means with which the landlord can fix the problems created. Before moving out, putting putty on holes or just giving the place a fresh coat of paint is key to ensuring the landlord is pleased with the quality of the walls and ceilings. Make things look brand new again! Many stains and spots on carpets end up unnoticed or forgotten. Once the furniture is out of the room, these spots can become visible and are one of the core reasons people tend to lose security deposits. Take a good look once rooms are empty and determine if there are any leftover marks on the carpets. Take the time to work out each and every stain to ensure landlord satisfaction. To prepare for tenant move in, landlords work tirelessly to clean up apartments or homes. The best way to keep all parties happy is to be diligent, and remember to make everything just the way it was the day of move in. 7. Not the Best Cleaner? Hiring Footprint Commercial Cleaning ensures that all aspects of the investment property or office are clean and ready for move out. Stress is lifted from the shoulders of those already busy trying to pack and situate in a new location.